WASHINGTON (CNS) — By day’s end Feb. 15, members of the U.S. Senate had rejected four immigration proposals, leaving it unclear how lawmakers will address overall immigration reform and keep the Deferred Action for Childhood Arrivals program in place. Late that afternoon, Archbishop John C. Wester of Santa Fe, New Mexico, issued an urgent alert to Catholics in his archdiocese to raise their voices “to support the ‘Dreamers'” and contact their senators and representatives to vote for a bipartisan measure to preserve the Deferred Action for Childhood Arrivals program, or DACA, which is set to expire March 5. Needing 60 votes for Senate passage, a bipartisan measure that included a path to citizenship for an estimated 1.8 million Dreamers — those eligible for DACA — and $25 billion for a border wall failed by six votes. The final vote was 54-45. A bill the Trump administration was supporting was defeated 39 to 60. Two other bills also failed. The U.S. House was pressing on with its own bill, which by mid-day Feb. 16 was not yet up for a floor vote. Described as “hard line” by opponents, it includes keeping DACA in place, funding a border wall, ending the Diversity Immigrant Visa program, limiting family-based visas, requiring employers to verify job applicants’ immigration status and withholding federal grants from so-called “sanctuary” cities. Other Catholic leaders decried lawmakers’ failure to provide protections for DACA recipients. “While thankful for the bipartisan majority support for protecting DACA youth, it is unconscionable that nearly 800,000 will continue to live in fear and uncertainty,” she said Feb. 15. “As it has for more than 100 years, Catholic Charities will continue to stand with and advocate on behalf of migrants and others in need. Not because they are migrants but because they are children of God,” she said. Holy Cross Father John I. Jenkins, president of the University of Notre Dame in Indiana, echoed that disappointment, saying: “These young women and men have done nothing wrong and have known life only in the United States. The Dreamers who are enrolled at Notre Dame are also poised to make lasting contributions to the United States. Even if the legislation seems to be stalling, some like Kevin Appleby, senior director of international migration policy at the Center for Migration Studies of New York, still see hope. Since September, when President Donald Trump announced he was ending the Obama-era program and told Congress to come up with a legislative fix, the U.S. Catholic bishops individually and as a body have been urging Congress to protect DACA. Since 2012, DACA has allowed some individuals brought as minors to the United States by their parents without legal permission to receive a renewable two-year period of protection from deportation and to be eligible for a work permit. As of 2017, approximately 800,000 individuals had DACA status. Since Trump rescinded the program, many immigration advocates have urged members of Congress to pass the Development, Relief and Education for Alien Minors Act, or DREAM Act, which has long been proposed. The bill is what gives DACA recipients the “Dreamer” name. In Arizona in late January, Bishop Edward J. Weisenburger of Tucson and his predecessor, now-retired Bishop Gerald F. Kicanas, urged passage of a “clean” bill, like the DREAM Act, to preserve DACA. Their commentary was posted on the diocesan Facebook page. “While all would agree that reasonable border protection is needed and while clearly countries have a right to protect their borders, it is wrong to barter the lives of these young people by making their protection contingent on a wall or stringent border protection that is unreasonable and a waste of taxpayer’s money. 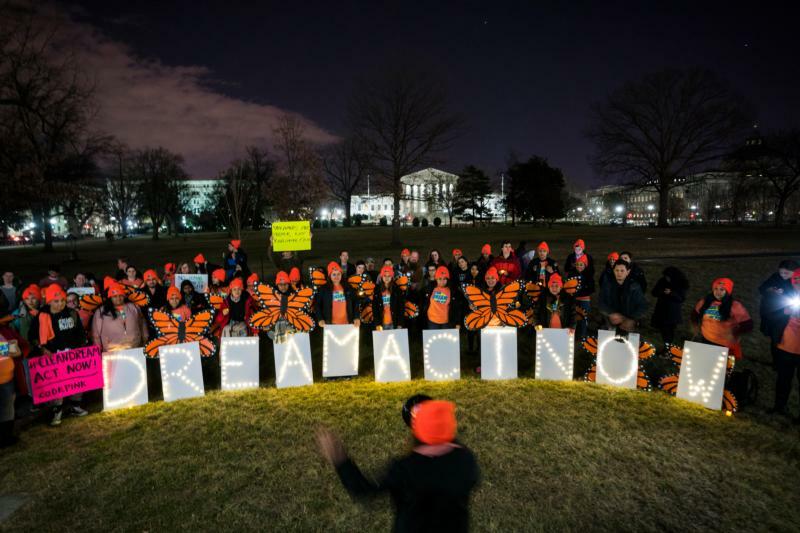 Congress should pass the DREAM Act as a stand-alone bill,” they said. In a Feb. 2 letter to Arkansas’ senators and representatives in Congress, Bishop Anthony B. Taylor called for grass-roots bipartisan support for “a just and humane solution for the Dreamers whose fate is in your hands.” He, too, urged they pass a narrowly focused bill to save DACA.